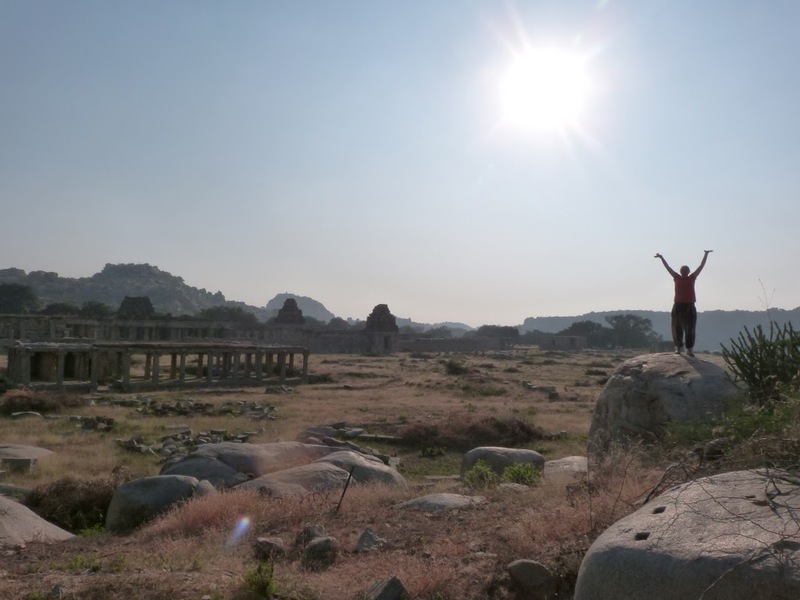 Our journey to Hampi marked our first experience of the famous Indian rail network! As first impressions go... Not bad! We went firstly in AC3 class to a town called Hubli where we then changed to the far cheaper and more basic sleeper class to Hospet Junction for Hampi. AC3 was great: relatively spacious, comfortable and we were lucky to be sharing a berth with a lovely old Indian couple travelling home to Chennai who wanted to know our life stories. When we explained we didn't have jobs they weren't best impressed and couldn't believe we would choose to spend 6 months living out of our backpacks. Sleeper whilst more basic gave us a great view out of the open window to watch sunset over the increasingly flat and dusty plains, feeling the wind in your hair as the train hurtles along almost makes up for the sore bum and crowded berths. We arrived to the bustling Hospet after dark and unfortunately the ferry across to the other side of the river from Hampi where we were hoping to stay had ended and we therefore had to take a rickshaw the LONG way round over the bridge to Virupapuragadda (try saying that 3 times) conveniently costing us more, however it turns out our friendly rickshaw driver 'coffee boy' actually charged us a fair rate for the journey, quite a surprise. We stayed at a place called Sunny Hostel, whilst our bungalow looked cool from the outside, it was pretty worn and tired inside, full of cobwebs and we're now pretty sure we got a bit ripped off, even though the price was still super cheap just maybe not as cheap as other people paid, which is becoming a frustrating trend in India. 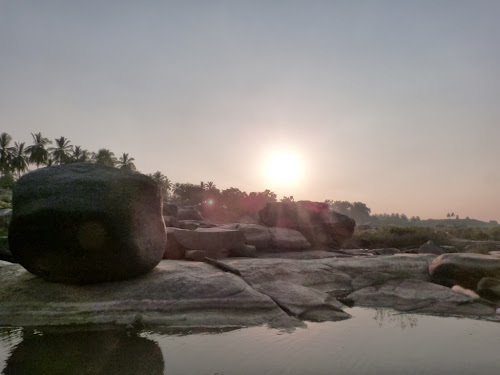 Knackered from travelling we hit the hay ready to explore the ruins and landscape that had so far been hidden to us by the darkness. Wow. 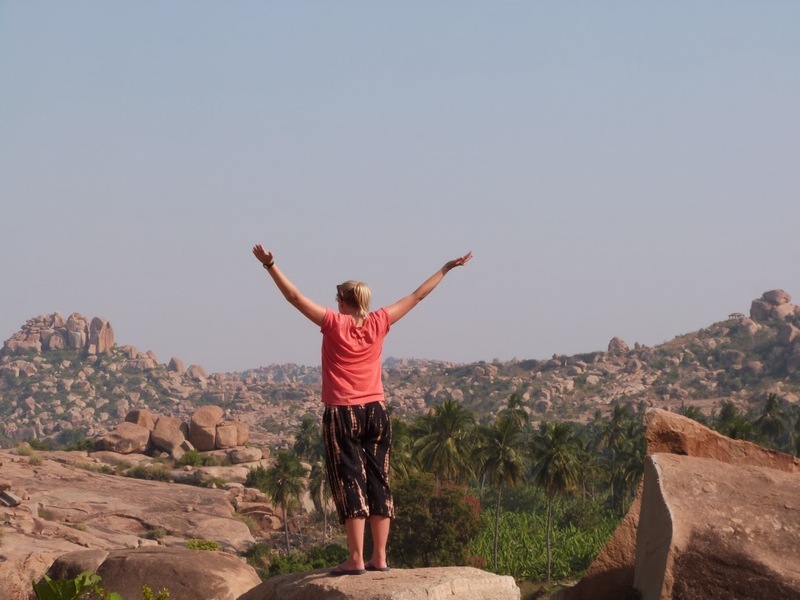 We awoke to be greeted by hands down one of the most beautiful places we've ever been. 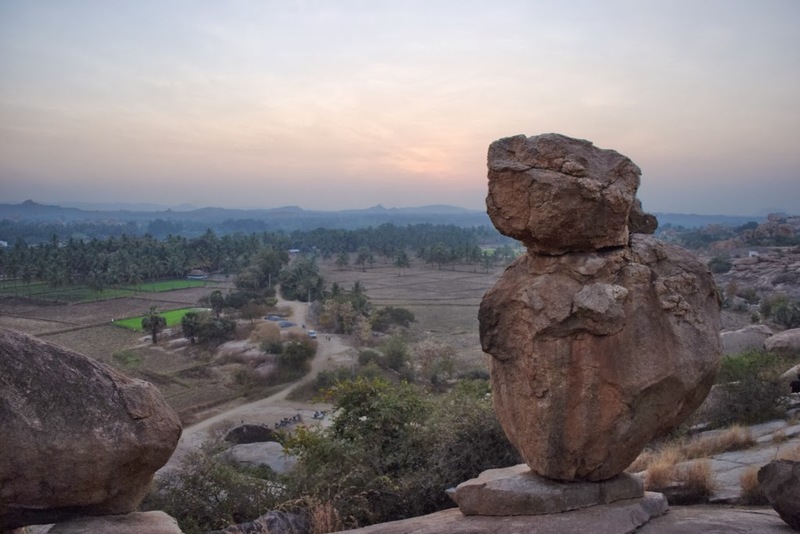 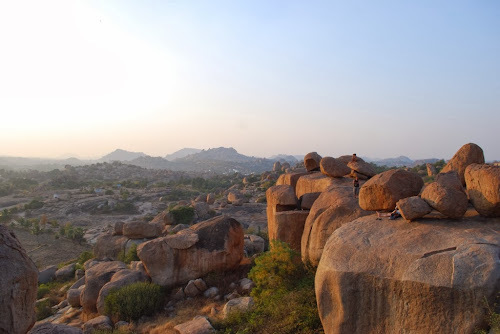 Seemingly endless boulders of all shapes and sizes mysteriously perched atop one another creating small mountains that seem to perfectly frame the beauty of the crumbling remains of the Vijayanagar temples to whom Hampi was home. 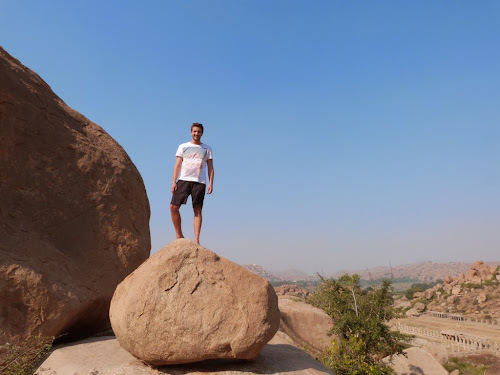 It really was special, unlike anything you've ever seen, all at once you felt like you were walking through the set of a Roman epic, a mission to Mars and all the while waiting for a prehistoric T-Rex to poke its head around the side of a boulder. 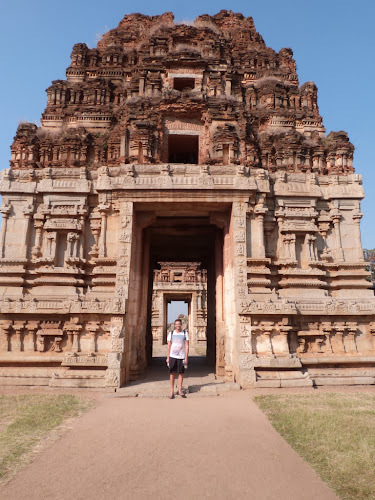 One of the best parts of it all was that you were free to roam as you pleased amongst this beauty, there were no barriers, only a few sites with paid entry, and just the blissful sunshine to guide your way through seemingly endless scenery. 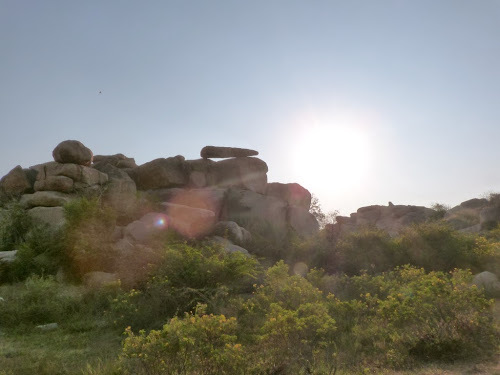 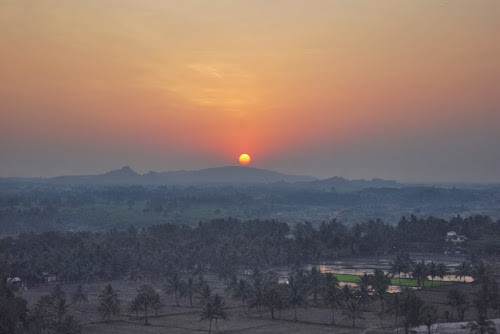 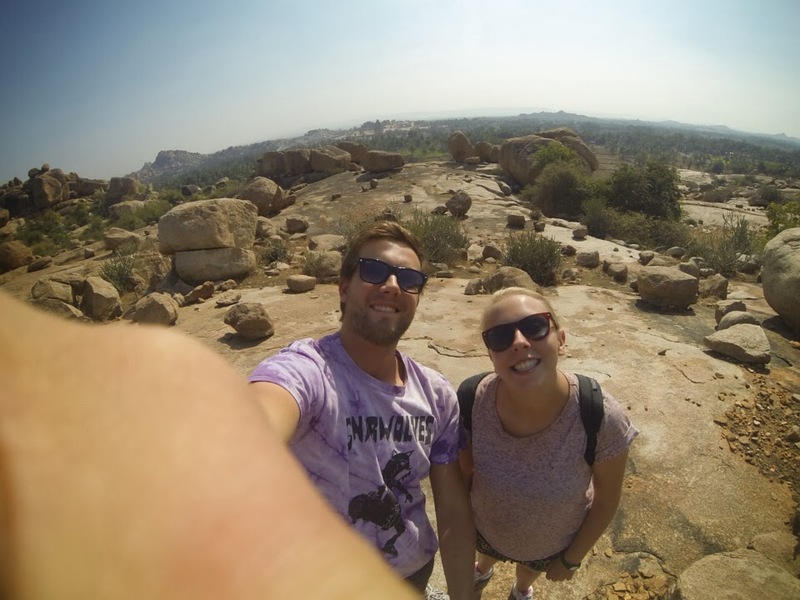 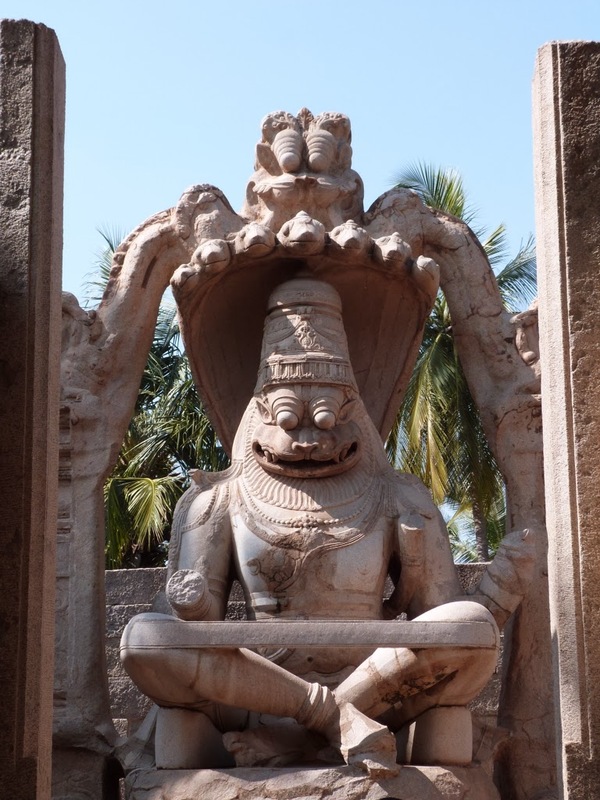 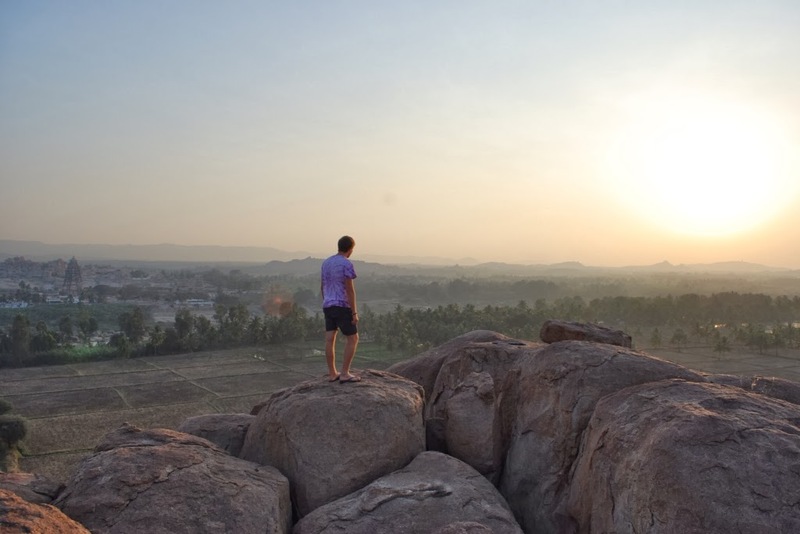 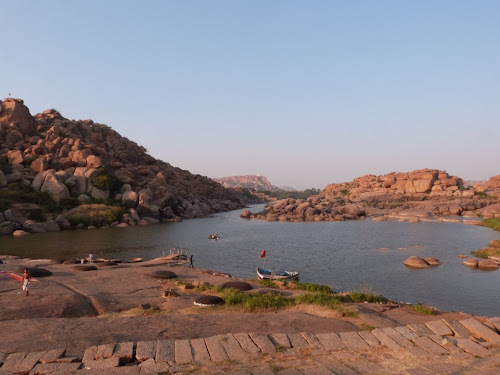 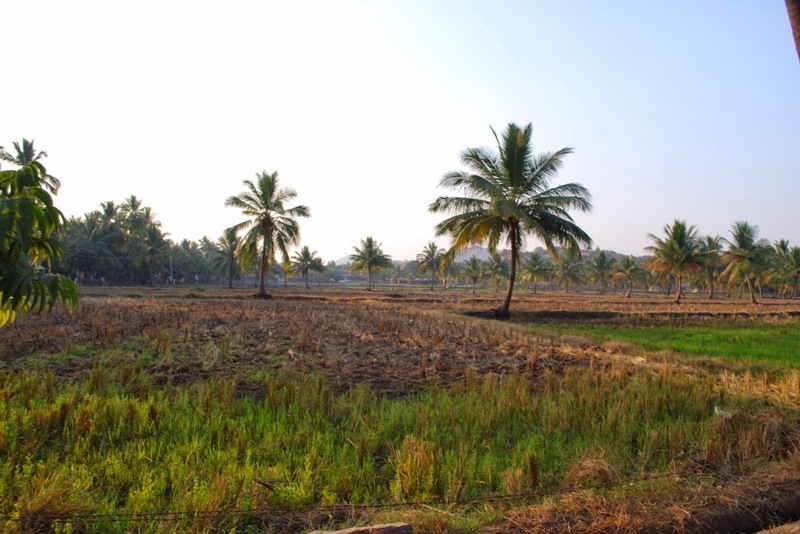 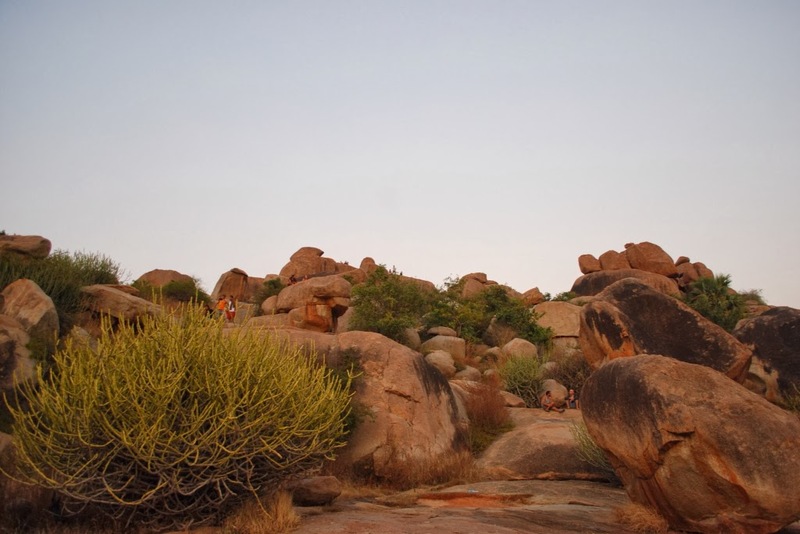 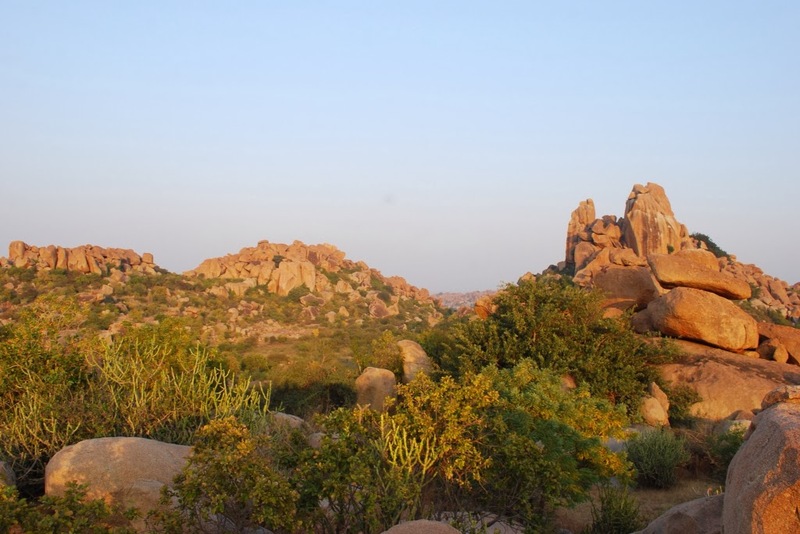 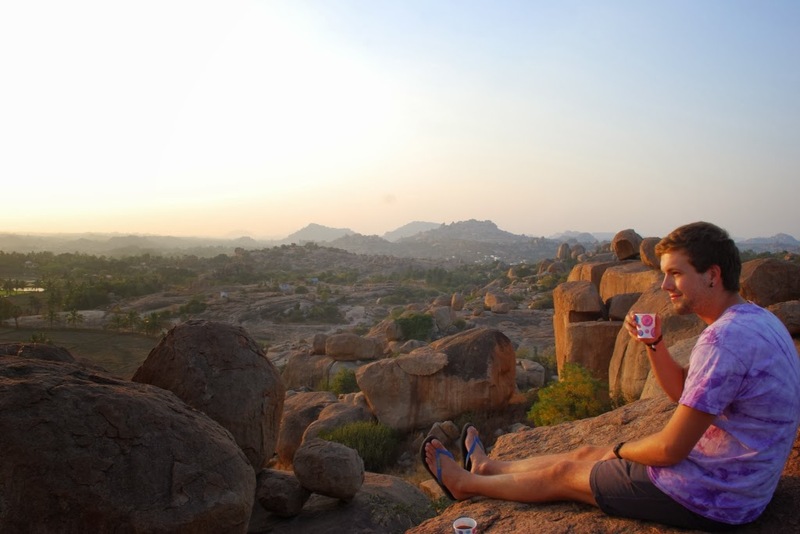 Enjoy a few of our many photos from Hampi and it's surroundings. 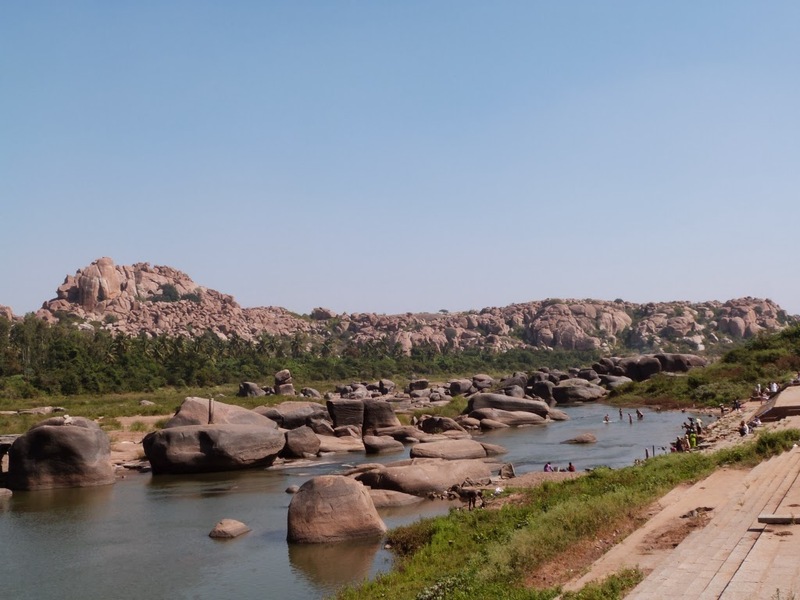 We decided to explore on foot, so we crossed the river on the little motor boat that poodles across the tiny stretch of water to Hampi's washing Ghats and you're greeted by the central Virupaksha temple, the only temple still 'active' (people still flock to worship here as we found out on our final day, the celebration of the engagement of Shiva and Parvati). Hampi does also have it's fair share of hawkers, particularly those offering rick shaw tours but a quick no and they usually left us alone. The history of Hampi is as rich as any part of India. The Muslim conquerors broke each and every Hindu statue that the Vijayanagar dynasties had built, breaking the trunk of Ganesha elephant gods, the arms off of depictions of Shiva, in so doing removing the spiritual power of these idols. 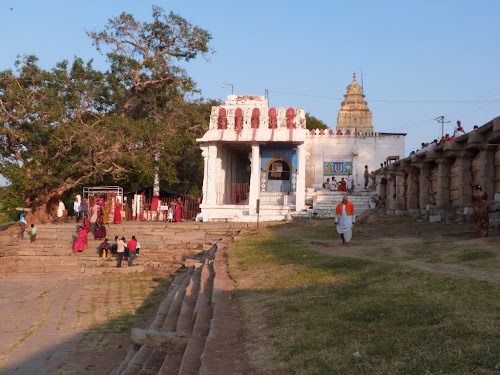 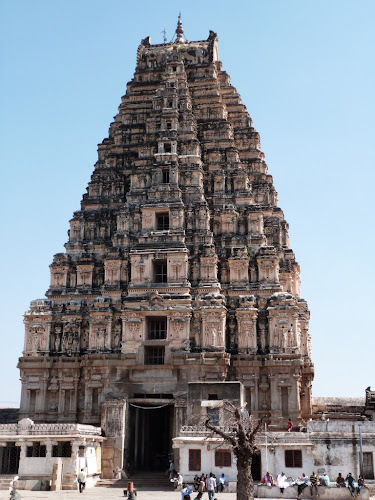 However the Virupaksha temple was left untouched, as the Shiva idol there did not take the form of a God but was merely a Shiva Lingum, a kind of phalic stone emerging from the ground, and as such the spiritual power remains in the temple and many Hindu pilgrims flock to Hampi to pray every year at the temple below. We found this out as on our last day in Hampi we saw the hoards of pilgrims flocking to the temple to celebrate the engagement of the god Shiva and his wife Parvati. The roads were crammed with busses luckily we left more than enough time to catch our train. 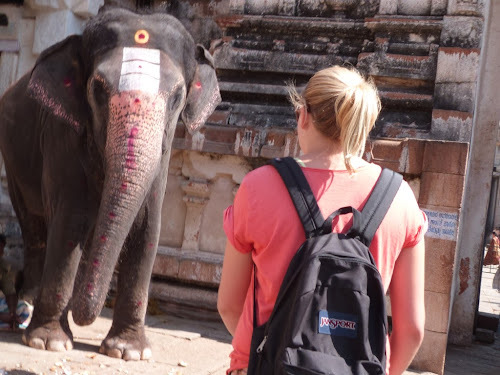 This is Lakshmie the temple elephant who will bless you for a coin, however clearly the coin Josie gave the elephant wasn't enough for good luck and the elephants keeper pocketed the penny. 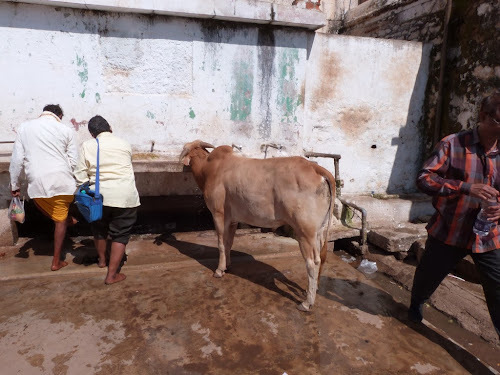 Here's a village cow taking a leisurely drink from the water taps. We learnt all about the religious significance of Hampi and a lot more on a bicycle tour of the many, many temples of Hampi. It was very interesting to learn the rich history of the kingdom and all the different gods, whose statues remain scattered throughout the landscape albeit missing vital body parts that lose their holy power. 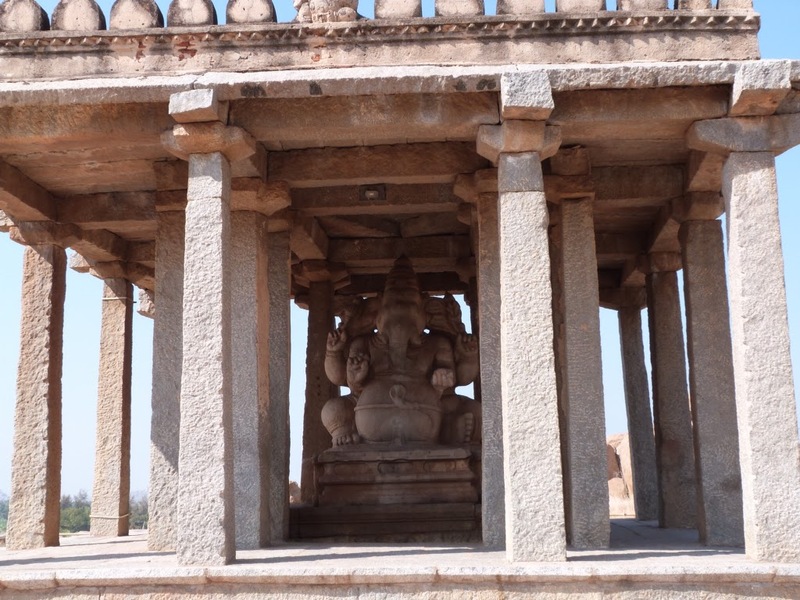 Including this awesome 3 metre tall Ganesh. 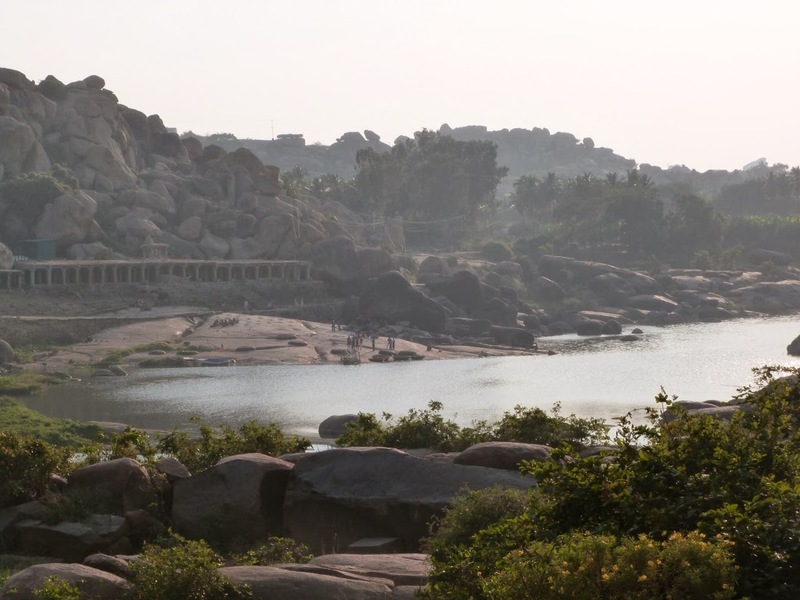 All of these beautiful statues were carved out of single granite boulders that litter the landscape. 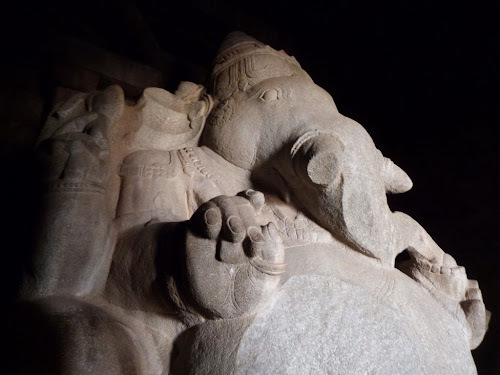 How they did such intricate carving on such solid stone 400 years ago is mind boggling. 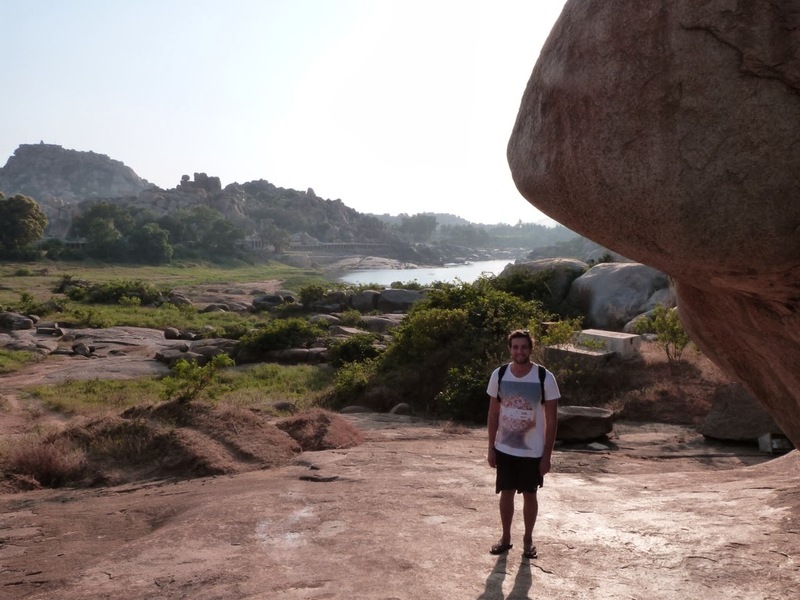 It was,however, very hot, and we were cycling around on fixed gear crappy bikes, on a supposedly 'flat route'. 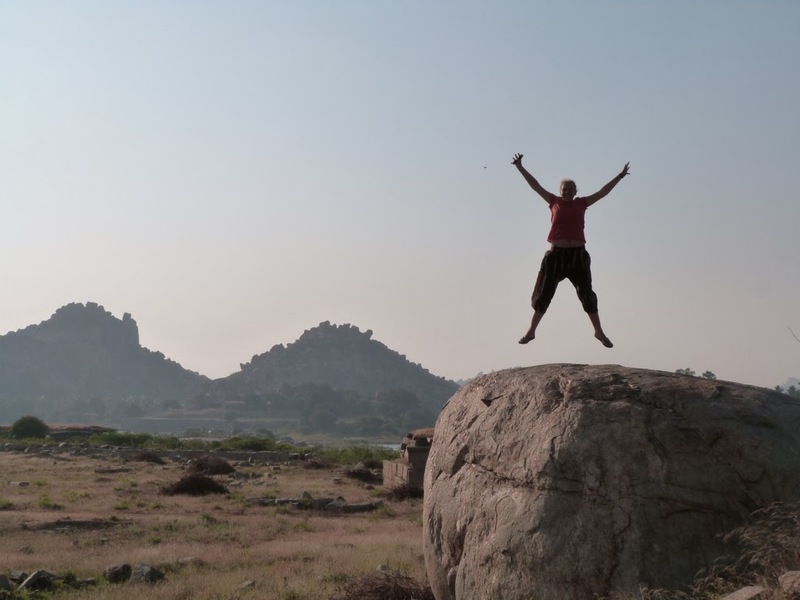 Unless flat means hills in Hindi. A lovely Australian couple that were also on the tour with us had sensibly got an auto rickshaw and were concerned for Josie's fair skin and lack of headwear in the scorching mid day sun. After about five hours we were most definitely templed out. 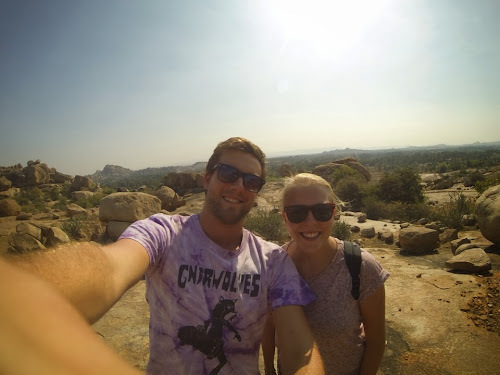 Our keen tour guide asked if, for a little more money, we can also go on the afternoon tour as well, we politely declined and cycled back into town to fill our empty stomachs. Chilling in the rooftop cafés across Hampi was another real highlight of the place there is a really calm and relaxing atmosphere that permeates through the remaining bazaar, it would be a tragedy to see it levelled. One of the most impressive was the Queen's summer palace centred on the impressive Lotus Mahal where all the females of the royal family would retire to in the summer under of the protection of a team of unichs that stood guard in the towers along the high wall. This was also where they kept the 8 royal elephants each in a different decorative stable. 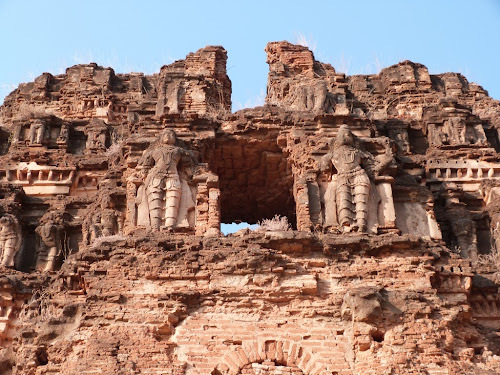 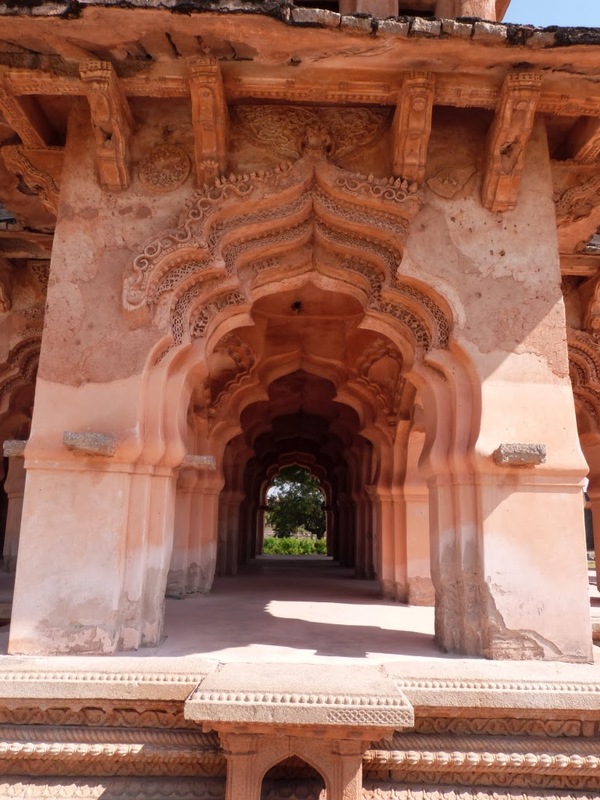 The structures, in particular the Lotus Mahal (above) had a Muslim influence particularly noticeable in the elaborately decorated archways and in fact around the royal palace area had its own Islamic quarter, leading to the area remaining relatively well preserved. Our guesthouse had a really good restaurant, where everyone sat on cushions on the floor and ate from low tables. 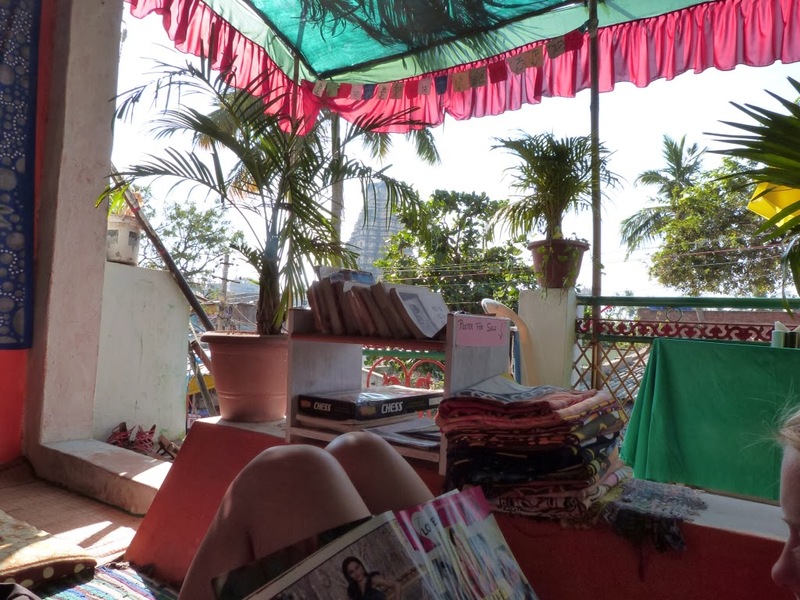 The restaurant shows films very night and we got to watch the departed, a top film. The area on this side of the river is nicknamed little Israel, and sunny guesthouse was the Israeli tourists accommodation of choice. 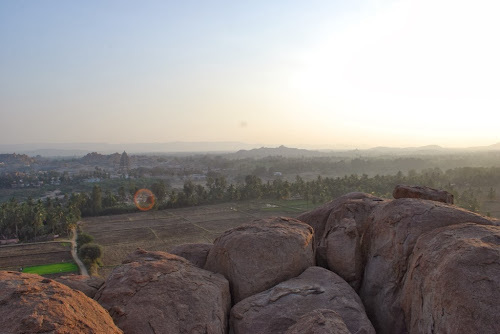 So the next night the film was in Hebrew. 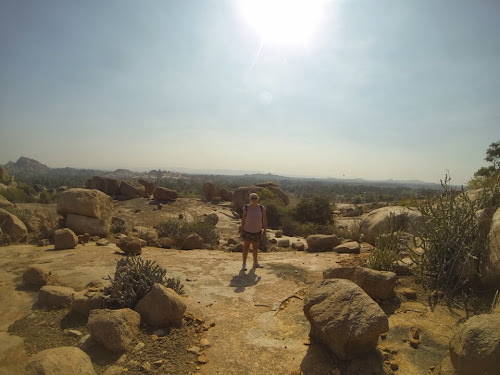 There is even a makeshift synagogue, oblivious and overwhelmed by the unexpected population of Israelis Olly laughed at a cheesy poster of what looked like a Rabbi and then received an evil look from a guy outside on the phone in a Kippa. Whoops. 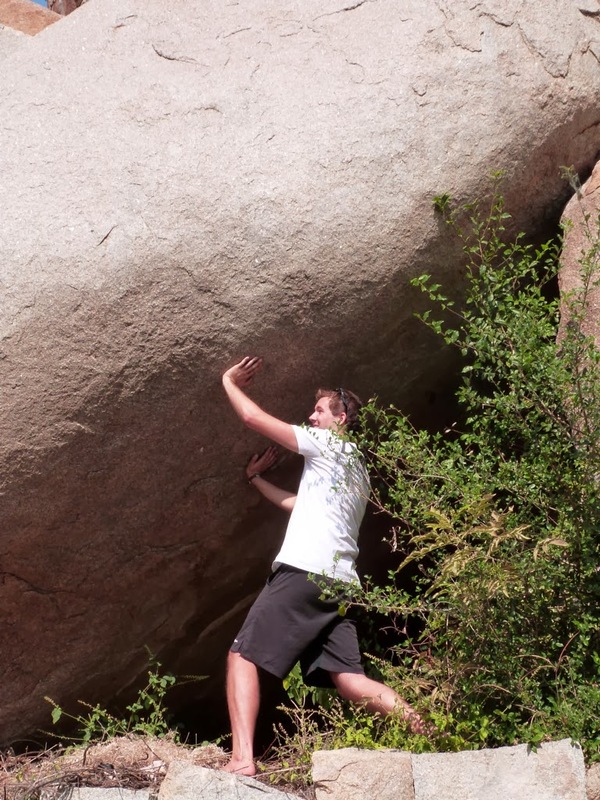 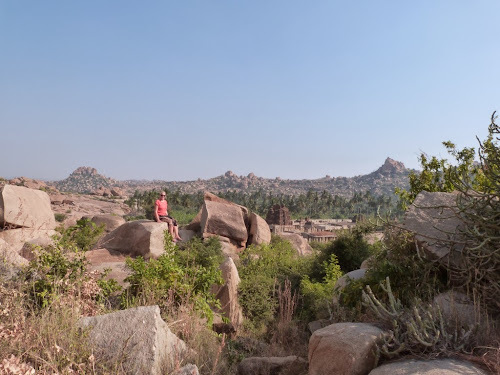 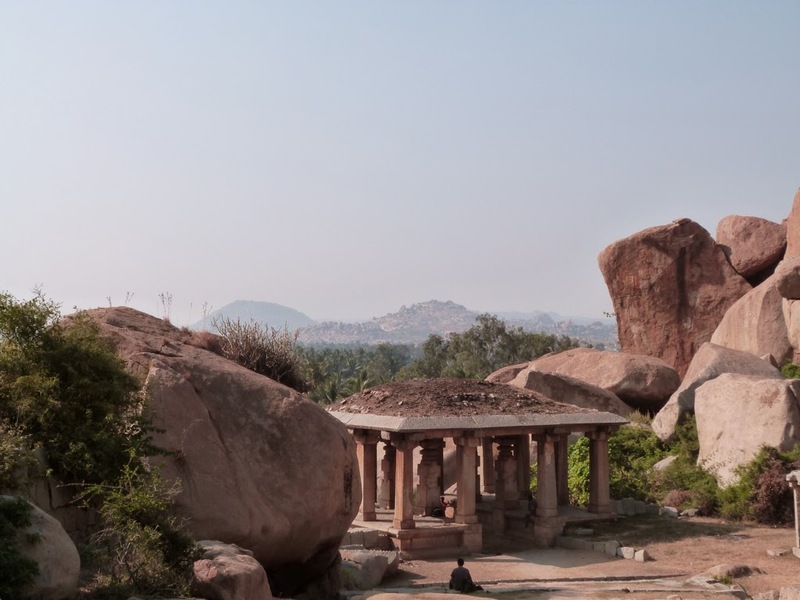 Hampi is an ideal place to just roam around as there is so much to see, when you get into the rocky area you feel like you have it all to yourself. 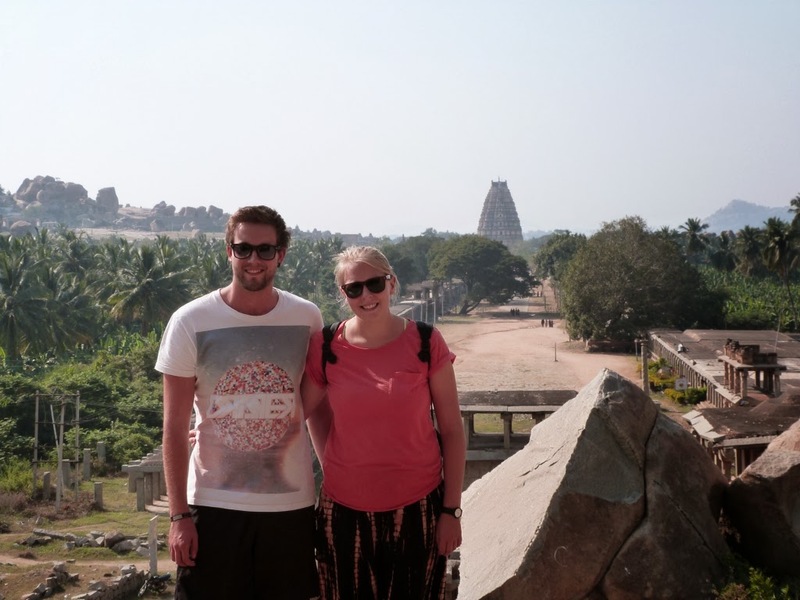 Another good way to explore further afield is by moped although we sadly only had a couple of days. 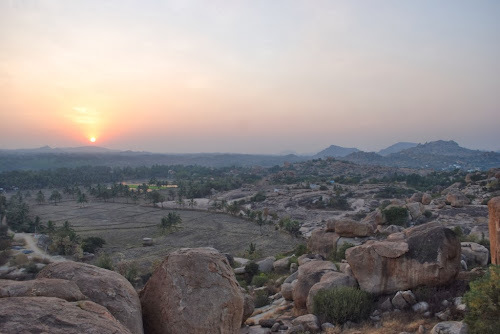 One evening we climbed to the top of a boulder hill and watch the sunset. What a view, you could see for miles! 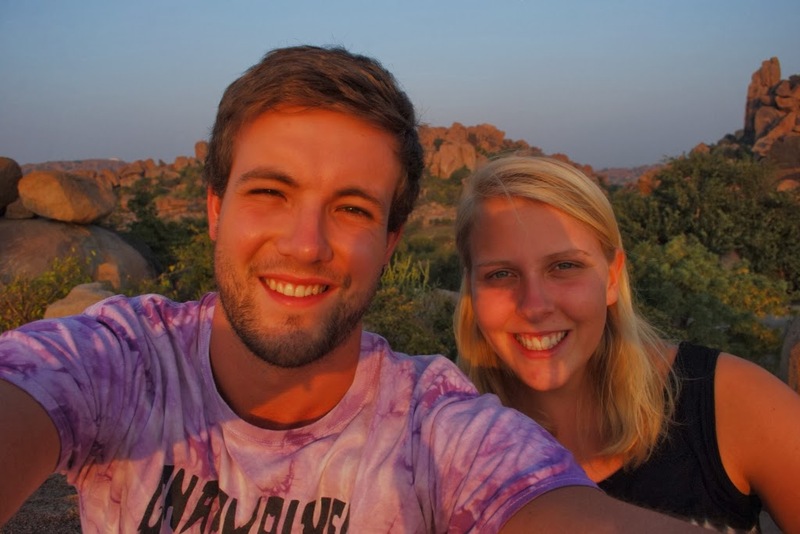 To be honest we wish we had another day there, we didn't want to leave, and you could tell some people just hadn't left, a real hippy vibe confounded in the distinct smell of a certain herbal indulgence all through town. 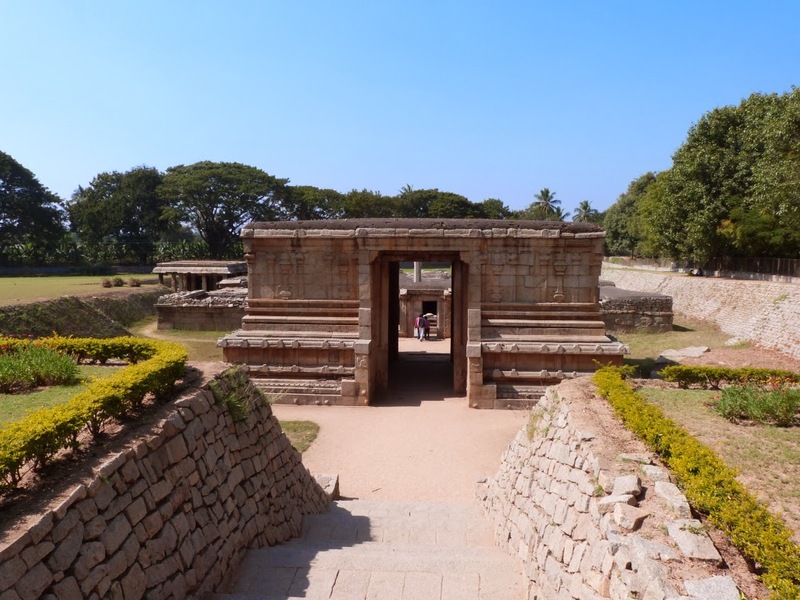 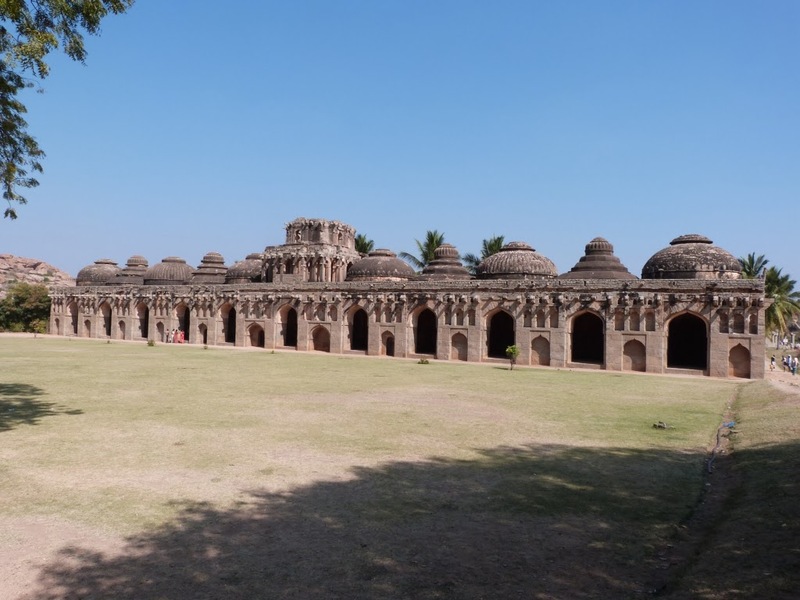 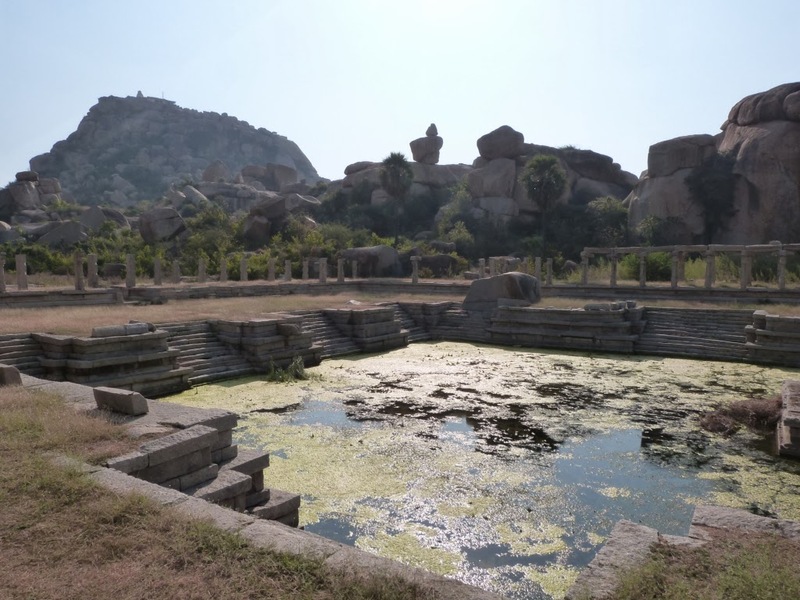 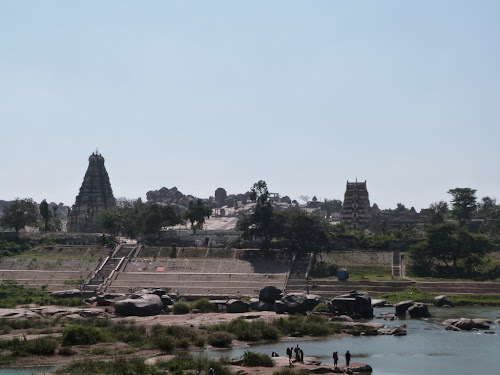 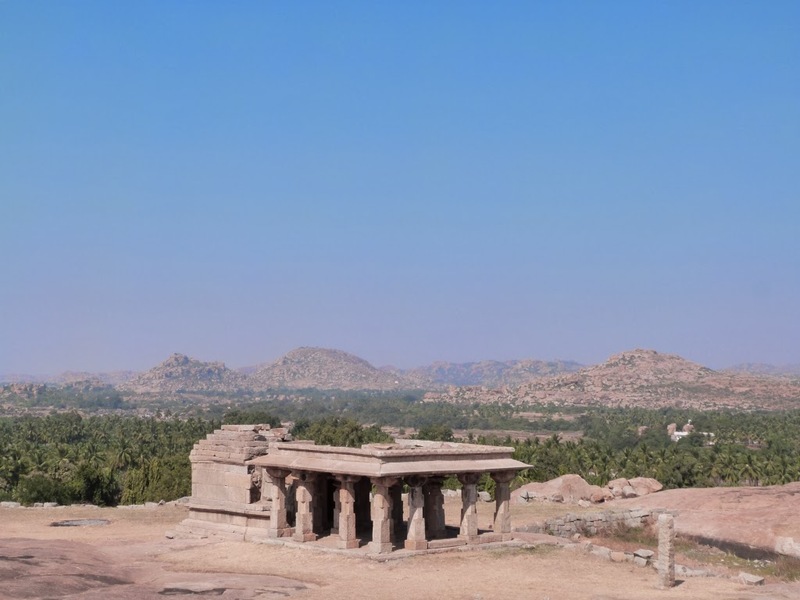 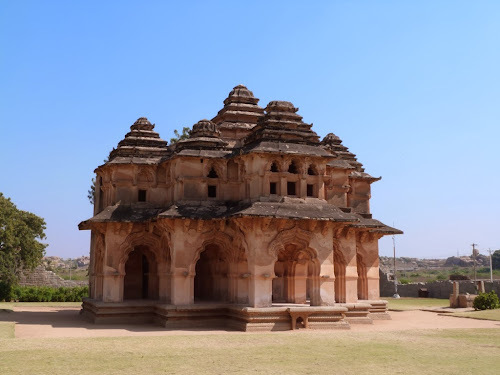 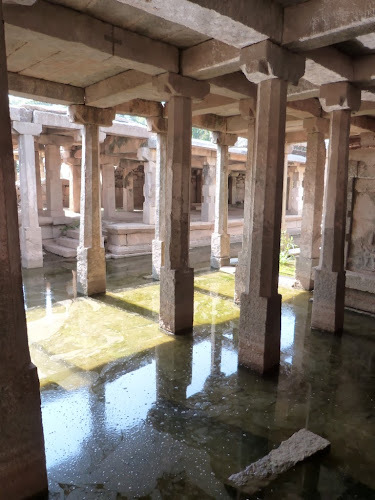 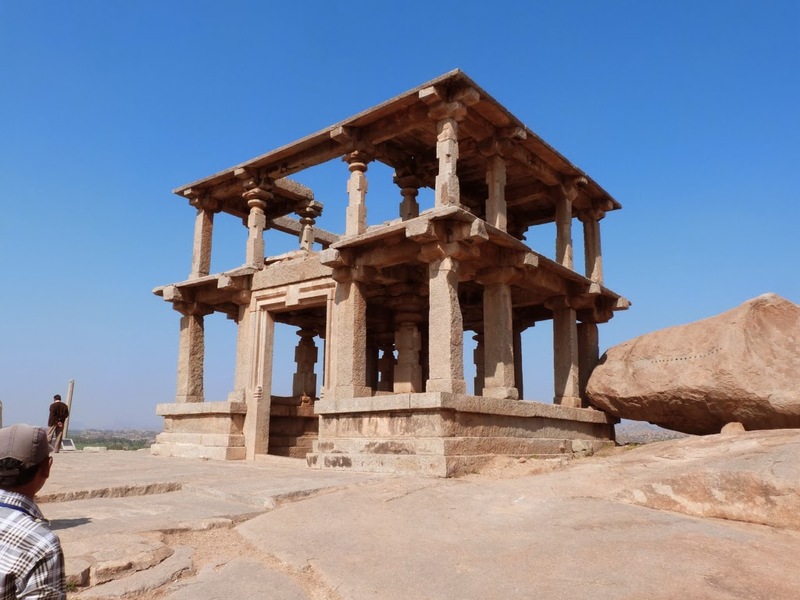 The settlements in Hampi arose from the dust as is the case all over India, people wanted to live there initially due to the religious significance of the temples and then due to the economic opportunity that tourism presented. They are now, however, coming to the stark realisation that all the land is therefore 'owned' by the government, which means that actually all these guesthouses and cafés, technically aren't really allowed to be there. 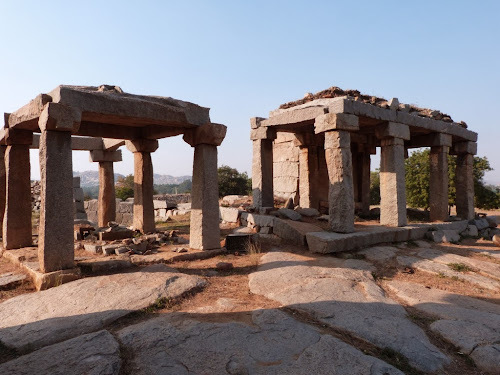 The government have already demolished the old bazaar in Hampi town and all that remains are the stone structures of the market that look like ruins in themselves, and aren't too dissimilar from the temples. Eventually all of Hampi town and the other side of the river where we stayed will be demolished. 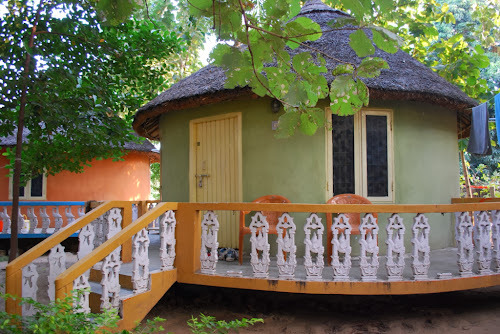 If tourists want to visit Hampi they will have to stay in nearby Hospet or one of the newly built enclaves to house displaced residents that will conveniently also have several more expensive big brand hotels, not small home stays as is currently the Hampi style. 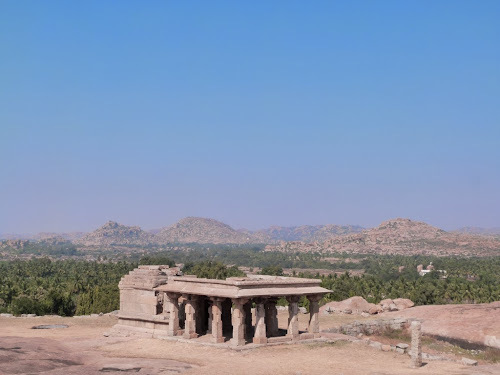 I think it is a real shame, because Hampi town was not big and ugly, it was small and didn't ruin the integrity, beauty and significance of the surroundings. The cafés and accomodation were run by local people who have lived and made their living here, it adds to the character of the place, generations of people from the Vijayanagar dynasties to the Muslim conquerors, to the Hampi settlers and religious pilgrims, to the hordes of road hardy backpackers, all clearly collectively awe struck by the beauty of the landscape. 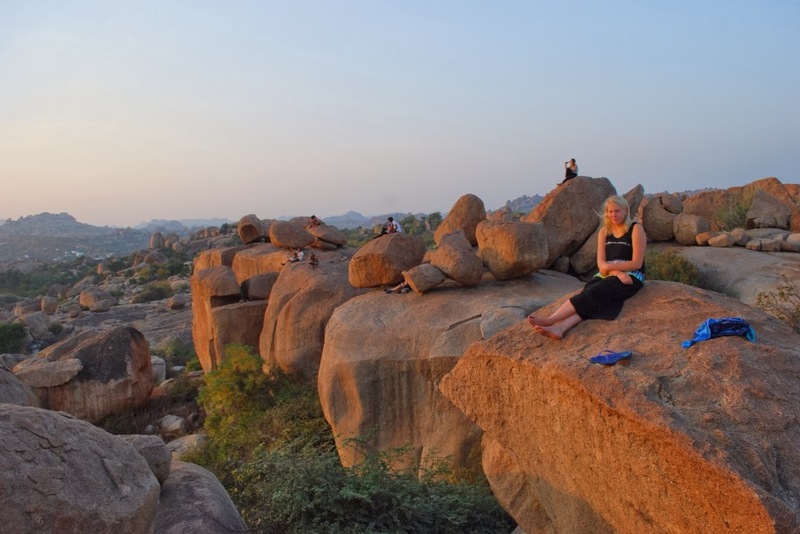 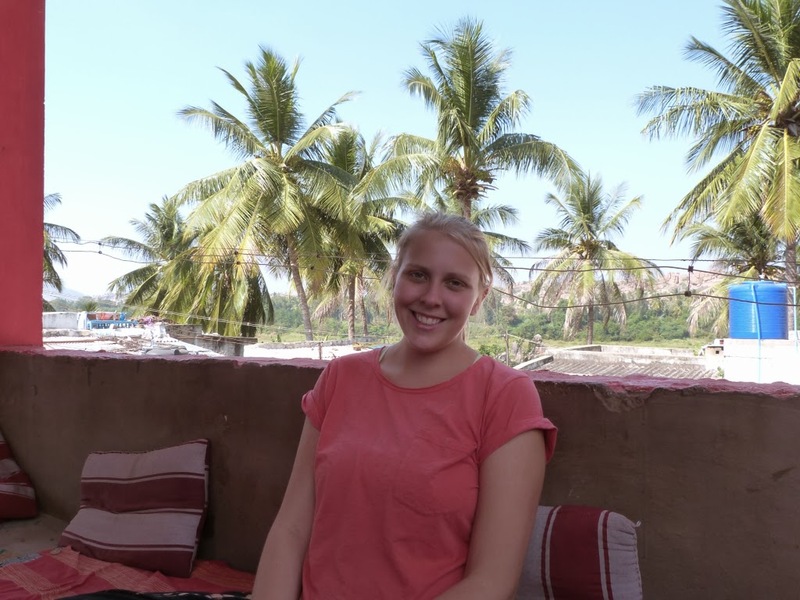 We felt privileged to be able to stay in Hampi and advise anyone to go now before it's too late! A highlight not only of our time in India but our travels so far.